As a kid I remember my grandmother had a glas cabinet filled with Lladro procelain dolls in various poses amd depicting scenes from the country side. So, naturaly when I saw the collaboration directed by Spaniard Jaime Hayon, the American artist Tim Biskup and Japanese artist Shin from studio Devilrobots I was amazed. The collection called the Guests, is composed of 250 large pieces of about 20 inches tall and a series of small ones of about 11 inches produced in a numbered open edition, was a great challenge for all the artists involved because the fragile media represented a world appart from the kind of work they are used to do. 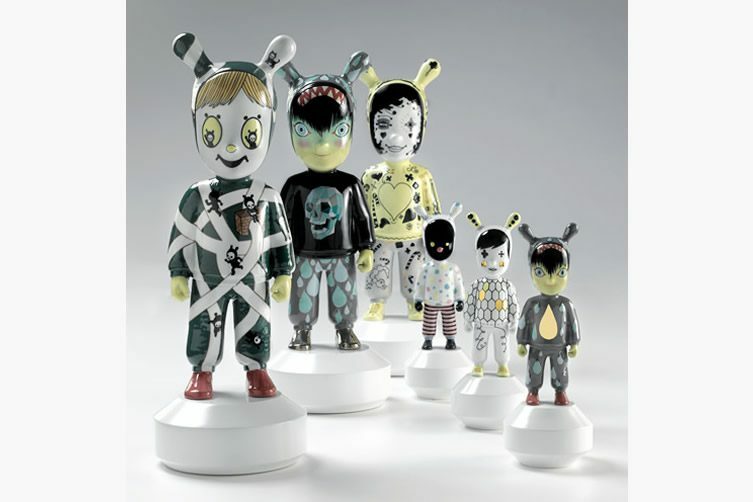 The pieces made and painted by hand at the Lladro atelier in Valencia, Spain from beginning to end by higly skilled artists, and were inspired by the many vynil figurines you can find in Japan's pop culure. These little dolls are certainly made for those serious are collectors with deep pockets but depite that it also means that the success of the collection is only the beginning of many collaborations to come between the traditional decorative company and modern designers. Have a great start of the week and go out there and play with some dolls! Wow the work involved in these is incredible! So unique. Not my cup of tea but I appreciate the craftsmanship for sure. Love the post, I would totally buy these! I love hearing about such intricate and beautiful handmade things. It's amazing what the human hand is possible of. I really like the whimsical spirit of these as opposed to the more classic Lladro figurines. Thanks for sharing Elie! The detail of each doll is amazing. These remind me of a tiny set of harlequin dolls I had as a kid. The details of these dolls are amazing. I can see why they're collected and cherished. amazing work! I've never seen these before. Wow, i'd never tought these dolls cauld have so much work behind! These are amazing--I immediately started making mental notes about which one (it would actually need to be 2 since a pair would be even better!) that I would pick. 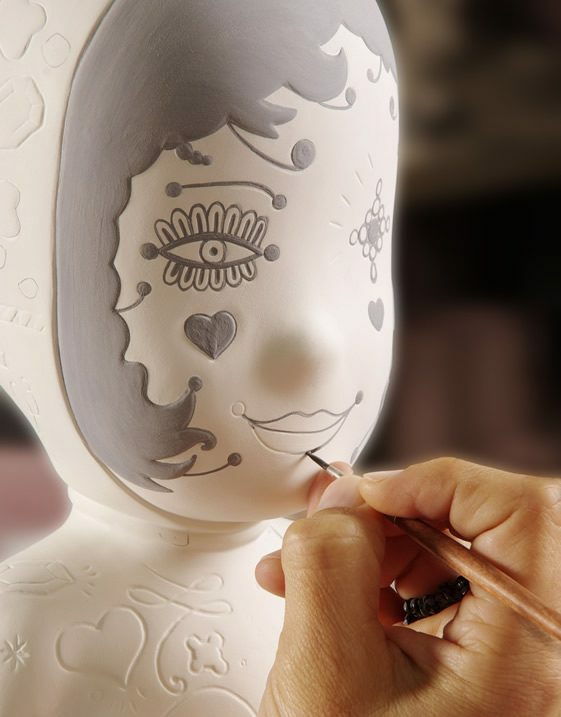 This is such a cool turn for Lladro! Thank you Elie for your sweet birthday wishes! It was a very happy one! Completely unique! I can see why people collect them! Wow! Those are amazing!! I'm always amazed at people who are just so naturally talented like that! I'm kinda scared by them! Is that bad? I'm with Elle–they're amazing, but a little scary, too! Wow, can't believe these are handpainted! And I thought Barbies were cool! Oh how fun and the faces have such great expressions! Oh wow, I've never seen dolls like this this before, They are so unusual and cute! This is so delicately done! Amazing!! These are just incredible. What beautiful work. I was always more of a Hot Wheels girl ... :) Kidding. (Well, not really.) These really are beautiful. I'm stunned at the talent it takes to create these dolls. These are so cute! My grandparents collects the Lladros too! I'm actually starting to inherit some of them... they are so intricate! wow! these dolls look so strange and awesome at the same time. i love the fact that they're hand-painted, too.